The next day Splinter ends the Turtles’ practice early so he can meditate once again, searching the astral plane for the presence he felt the day before. Finally the Sensei reaches Gosei Hatsumi, a proud man who lies in his deathbed in Japan. Hatsumi has been searching the astral plane for someone who could help him continue the Gosei lineage. When Splinter asks what he could do to help, Hatsumi explains that the spirit force of the great Gosei Samurai Clan has been passed down from father to son throughout time. Now is his time to pass it along to his son, Kenji, but he lives in New York City and has turned to evil. Hatsumi hopes instead to pass the spirit force on to his grandson, before he too is turned to the dark path and the bushido spirit of the family is lost. Splinter again asks what he can do to help, and the old man explains that Splinter must allow his spirit to inhabit the rat’s body. The transfer of the Gosei spirit force must be made in person, but Hatsumi is too near death to make the trip to New York to perform the ritual himself – in fact, his body will perish in just 10 hours. Gosei needs Splinter’s body to accomplish his goal. Hatsumi warns that if his body dies before the transference takes place, Splinter will perish with it. The Sensei states that there is little time to waste and allows Hatsumi to exchange spirits with him. Hatsumi, now in Master Splinter’s body, leads the Turtles on the mission to save his family’s proud heritage. Gosei locates the elaborate building that houses his offspring and the TMNT make their way inside. The heroes discover that Kenji is a crime boss and he is preparing to give the “business” to his son, Hattori, who wants nothing to do with the “job.” Hatsumi tells the Turtles that he must speak with Hattori alone. Raphael and Donatello go off to search for guards and escape routes. While patrolling the building, Don and Raph find two men gloating over the planned assassination of Hattori and his father. 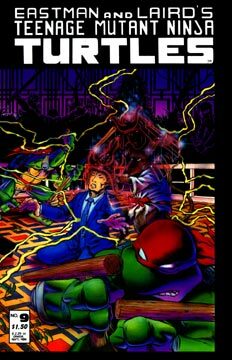 The Turtles do what they can to stop the killings, but Kenji is shot to death in the battle. The TMNT take out the final assassin and rush to Hattori’s side, who is crying over the dead body of his father. Hattori is extremely upset, and seeing a giant talking rat and Turtles only causes him more mental duress. Hatsumi attempts to explain the situation as the Turtles rush to seal the area off from more attackers. Finally Hatsumi is able to calm Hattori down by drawing the symbol from the young man’s dreams, the crest of the Gosei Samurai Clan. Hattori is afraid and reluctant to accept the family’s life force, but he is gradually able to grasp its importance and accepts it fully. Just as the transference is made, Hatsumi passes away, returning Master Splinter to his own body. A lone ninja assassin enters the room by crashing through a skylight. Hattori feels that all is lost, but Splinter rallies him to fight the attacker. Now that he has the Gosei spirit, Hattori can defeat the assassin on his own. Hattori battles his assassin unarmed and wins! Splinter and Hattori bid farewell. The Sensei tells Hattori that he now has the spirits of his ancestors within him, and what he does with their power is up to him. The Master tells the young man to choose wisely, and departs.